On Friday 22nd September 2017 Milton Hall Primary School’s ‘School Council’ elections took place. 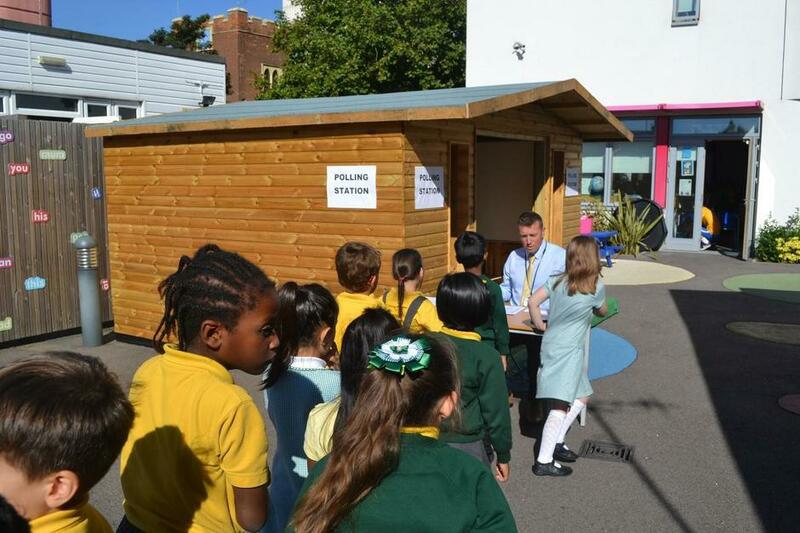 The new beach hut outside Murray class was transformed into a polling station for the day and every child from Yr 1 to Yr 6 voted for their own class representatives. The votes were counted with the winning candidates announced in a special assembly. The school council meet regularly and play an important role in decision making on key issues around our school. This was no ordinary 'Children In Need' day here at Milton Hall Primary School. The school councillors wanted to give both children and parents something to remember and make fundraising fun. In the school council meetings leading up to Children In Need it was decided that our very own deputy headteacher, Mr Spence, would be a great sport and a few events were planned. The first of these saw Mr Spence undertake the 'Ice Bucket Challenge' in front of parents and children on the playground before school. Over £40.00 was raised here alone. Mr Spence continued to deliver the fun and took up the challenge of wearing a princess dress and sang 'Let it Go'!